We all can feel the difference between working in a space without windows that relies on artificial lighting versus a space with access to natural daylighting. However, it is more than a “feeling.” Research has proven that spending extended periods of time in spaces with artificial lighting can have a detrimental impact on a building occupant’s biological and psychological wellbeing. Compared to those without windows, workers with windows and access to natural daylight received 173 percent more white light exposure during the work day. They also slept on average 46 more minutes per night. Workers without windows reported poorer results for overall sleep quality, sleep efficiency, sleep disturbances and daytime dysfunction. Based on this information, it appears that not only does artificial daylighting inhibit office workers performance, it also impacts overall sense of wellbeing and sleep patterns, which in turn, results in continuously exhausted employees who are less focused. Other benefits of natural daylighting include: cost savings, energy savings, occupant comfort, eyestrain prevention, increased concentration, better memory recall and mental function. 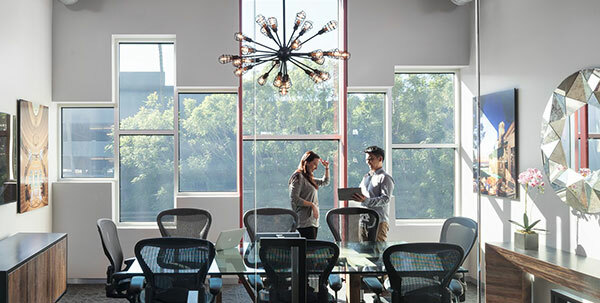 We also partnered with our parent company, Saint-Gobain, and conducted a survey of 400 office workers nationwide to discuss their office environments. Our results found that offices are not built to benefit employees, with 36 percent of workers reporting they do not have a window near their workspace and of those with access to a window, 65 percent have blinds or curtains that block sunlight at least some of the day. Knowing the benefits of natural daylighting, these numbers just don’t make sense. It’s time to reconsider how architects can design office spaces that allow for access to natural daylighting, increase employee productivity and eliminate heat gain and glare. One way to provide greater access to natural daylighting to increase employee productivity is through the installation of dynamic or electrochromic glass. By optimizing daylight to prevent glare, fading and overheating, dynamic glass allows office workers to maintain continuous access to natural daylighting without having to lower blinds or shades and rely on overhead artificial lighting. Access to natural daylighting and views of nature have also been proven to have strong benefits, including stress reduction, enhanced creativity and clarity of thought and an improved sense of well-being, which can ultimately result in a happier, healthier and more productive workplace. Get in touch with us to learn more about how access to natural daylighting can improve the health and wellbeing of your workplace.